To become a member email: enquiries@canterbury.cats.org.uk. By volunteering for us. Cats Protection Canterbury and District is run by volunteers. We are always looking for other people to help us in our work. By fostering for us. We do not have a main shelter so all the cats in our care are looked after by foster carers. To find out more follow the link. By donating money: Your donations, no matter how large or small, will make a huge difference to the lives of the unwanted cats and kittens in our care. Without you we simply wouldn't be able to continue with our valuable work. Click on the 'Donate' button on the right of the top menu. Thank you for your support. By signing up to play the Cats Protection Lottery. 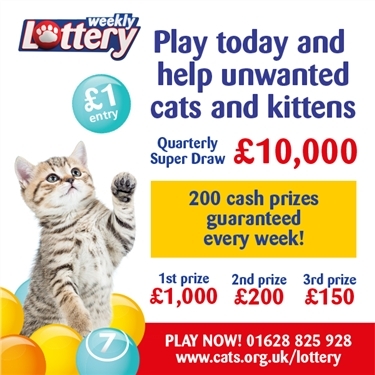 By joining the Cats Protection Lottery and nominating us Canterbury and District as your local branch our branch will receive any funds raised. Nominating Cats Protection Canterbury as your charity of choice on your Pets At Home VIP Card. By buying a gift from our Amazon Wishlist. For any further information please contact our branch by emailing enquiries@canterbury.cats.org.uk with the subject Support Us.